The Norfolk Terrier has been referred to as a “demon” when in the field or on the hunt. This may be due to its natural ability to hunt, dig, and explore when given the opportunity. It holds many of the standard characteristics that define all terriers, including being lively, courageous, curious, energetic, and self-sufficient. The Norfolk Terrier has a strong-minded character, but it can also be sociable and intelligent. The Norfolk Terrier requires a healthy amount of physical exercise to satisfy it. These needs can be met with a decent walk or a high-energy playing session outdoors. As a natural hunter, it enjoys the opportunity to investigate. If allowed to do so, it should be done in a safe and secure area. From an emotional standpoint, the Norfolk Terrier is an indoor dog, however it could survive in an outdoor environment with temperate to warm climates if necessary. The best situation for the Norfolk Terrier is living indoors as a house pet with daily access to a yard. The coat of this breed is a wire coat and maintenance of it requires combing one to two times per week. Additionally, the coat may require the stripping of dead hairs every few months. The major health concern for the Norfolk Terrier is commonly known as CHD, or Canine Hip Dysplasia. This is a common disease in many breeds of dogs that affects the development and joint of the hip. A minor concern for this breed is allergies. On occasion, patellar luxation is seen in the Norfolk Terrier. This involves the knee and the joints that extend and bend the knee falling off of the tract. In order to keep the Norfolk Terrier healthy, it is suggested that the hips and knees be regularly tested, especially as the breed continues to get older. The average life span of a healthy Norfolk Terrier is 13 to 15 years. 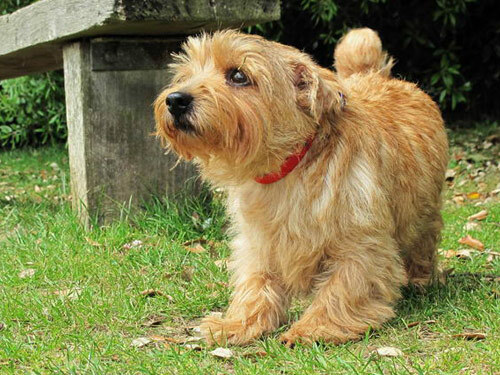 The Norfolk Terrier and the Norwich Terrier have an identical early history and development. When these breeds were being developed, the characteristic prick and drop ears were seen in both of them. For this reason, neither of the breeds has been able to claim to be more valid than the other one. Eventually breeders found out that there were problems with predicting the certainty of ear carriage when the two breeds were crossed with each other, thereby stopping the crossing of these dogs with different styles of ears. There were significantly more of the prick-eared variety and the drop-eared variety almost became nonexistent around the time of World War II. The continuation of the drop-eared variety is said to be the work of Miss Macfie of the Colansays. Breeders would come to her in the 1940s in an effort to renew the drop-eared Norwich breed and soon enough the drop-eared version became increasingly popular. Over time the breed became separated into two separately recognized breeds, but not without some controversy. Specifically, the recognitions happened in 1964 in England and later on in 1979 in the United States.